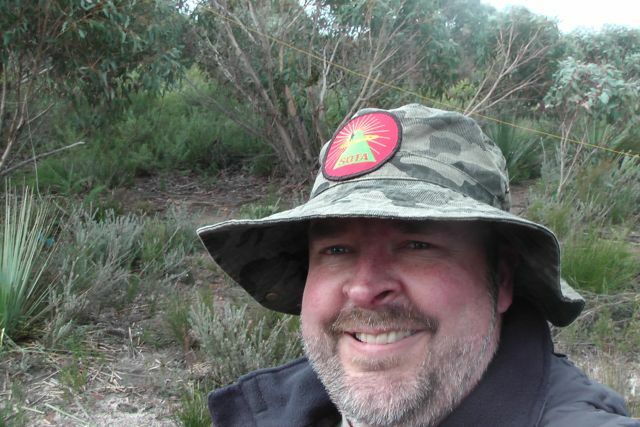 On Sunday, 18th August, 2013, Andy VK5AKH and I drove down to the western end of Kangaroo Island, OC-139, and activated an un-named summit, VK5/ SE-018 which is contained within the Flinders Chase National Park. It was a 2 hour drive from the Cape Willoughby lighthouse at the eastern end of the island, where we were staying as part of the International Lighthouse & Lightship Weekend (ILLW). The weather on Friday and Saturday had been very severe, with heavy rain, hail, lightning and very strong winds. In fact the wind speeds had gusted to 140 kph on the Saturday. The road from the lighthouse back to Penneshaw was totally impassable by 2wd traffic, so Andy and I had to take some dirt backroads, to get onto the bitumised Hog Bay Road, and then the Playford Highway. 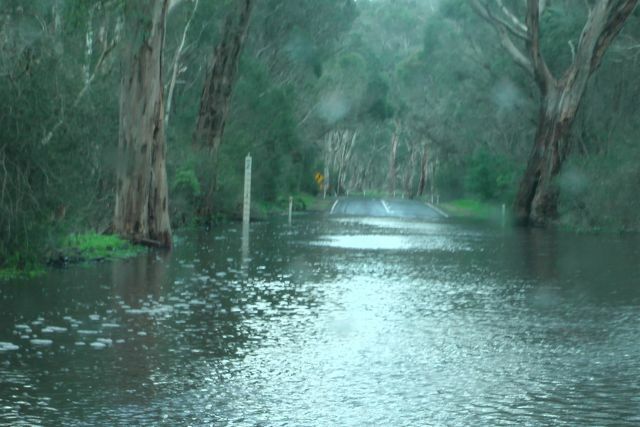 In fact some parts of the main bitumen roads were also flooded, and there was lots of debris on the road. We drove west along Playford Highway, through Parndana and continued on passed the West End Highway, following the northern side of the Flinders Chase National Park. 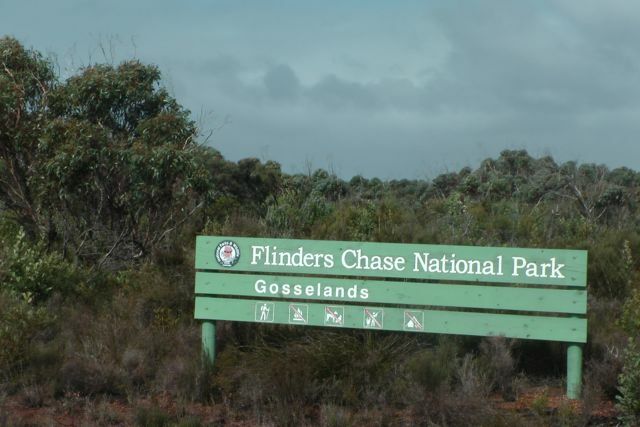 The Flinders Chase National Park is a vast area of wilderness which features the spectacular Remarkable Rocks and Admirals Arch as well as a colony of New Zealand fur-seals at Cape du Couedic. A network of walking trails and boardwalks enable you to enjoy the park and its diverse wildlife. The park which was established in 1919, is 328 km2 in size. 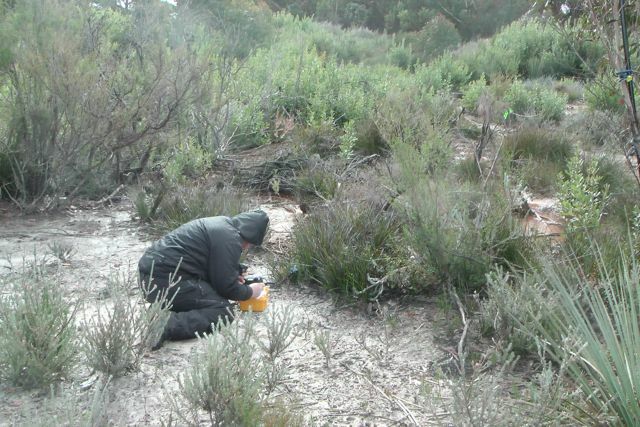 It is situated about 110 km west of Kingscote, the largest town on Kangaroo Island. A large amount of wildlife can be located in the park including kangaroos, echidnas, koalas, platypus, and wallabies. About 267 species of birds have been recorded. Andy I parked the car on the Playford Highway and walked 100 metres or so to the south, into the thick scrub of the park. We found a clearing and this is where we decided to set up, as there was a bit of room to stretch out the antenna. We didn’t want to go to far, because the weather was very threatening. As much as I wanted to test out my new bothy bag, the thought of cuddling up close to Andy in an enclosed space didn’t really appeal. The summit is not really a traditional summit. It is simply the highest point on the island. VK5/ SE-018 is about 310 metres above sea level and is worth just 1 point. 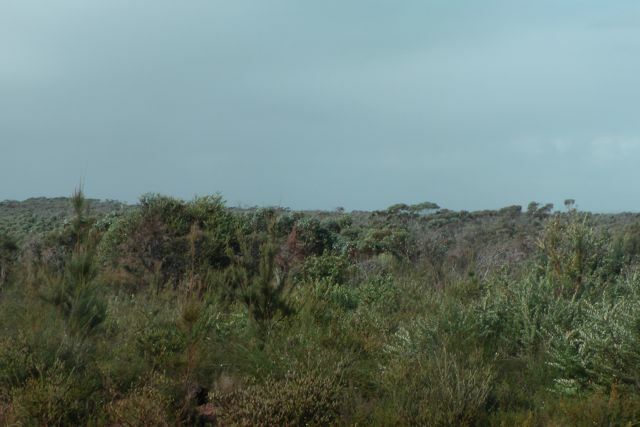 It is situated on the southern side of the Playford Highway and is contained within the Flinders Chase NP. We hastily set up my Yaesu FT-817nd, and my 40m/20m linked dipole. There were no rocks present which we could use to support the 7m squid pole, so we quickly attached it to a small nearby gum tree using about 4 octopus straps. The weather was getting worse and it was very windy. The squid pole was on a real lean. We turned the radio on to 40m, and went to 7.090 and I put out a call, only to be greeted with a massive pile up of hungry Chasers. Initially Andy and I operated by swapping the mic, but there were so many calling that we decided to work 10 and then swap operators. My first 4 QSO’s were with Brian VK5FMID; Larry VK5LY; Gary VK5ZK; and Andy VK5LA, all of whom had very strong 5/9 signals. Things were going great guns, but that was not to last long. A combination of antenna problems and poor weather put a quick halt to our activation. The BNC connection on my dipole gave up the ghost and signal strengths went down the gurglar. I ended up with 19 QSO’s on 40m SSB. I worked the following stations:- Brian VK5FMID; Larry VK5LY; Gary VK5ZK; Andy VK5LA; Ian VK5CZ; Mal VK3AZZ; Trevor VK5BAR (at the Cape Willoughby lighthouse); Tom VK5EE; Col VK5HCF; Nev VK5WG; Nick VK3ANL; Marc VK3OHM; Ernie VK3DET; Warren VK3BYD; Graham VK5KGP; Roy VK5NRG/p; Colin VK3UBY; Tony VK3CAT; and James VK2IB/p (qrp). Apologies to all those that were calling and who missed out. The wet weather and a very sick antenna lead had triumphed. I have added a video to You Tube of the activation. This entry was posted in National Parks, SOTA summits. Bookmark the permalink.